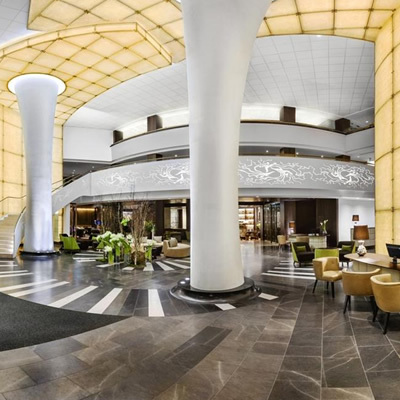 Kempinski Hotel Corvinus can be found in Downtown Budapest, just a short stroll from the Danube River. This enviable location means that by staying here, you’re going to be in walking distance of all the city’s main sights and attractions, which is a real bonus for a city break. The hotel itself comprises of 351 rooms, so its sizeable, however the team have that special ability to somehow make you feel as though you are their only guest. When we arrived, we were greeted warmly for check-in, our luggage was taken by the concierge who were a delight, and we were show to our room. 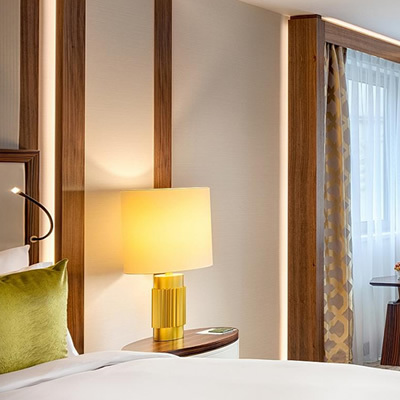 During this stay, we enjoyed one of their Grand Premium Deluxe Rooms which were recently refurbished earlier this year; so, our timing was just right. Our room was spacious and wonderfully modern, complete with beautiful views over Erzsébet Square, which is home to the Budapest Eye. Our room boasted a wonderful seating area that included a small comfortable sofa, along with a compact corner desk for those looking to catch up on some business. There was also a well-stocked mini bar and an espresso machine complete with plenty of pods for that ever-important morning espresso. 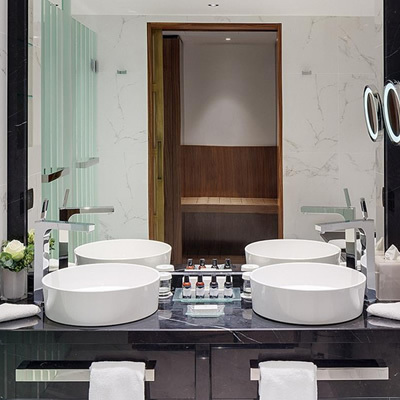 The bathroom comprised of a separate bath and walk-in shower along with his and hers wash basins, surrounded by an abundance of polished white marble offset by bold, polished fixtures and fittings. Our room also offers plenty of storage for those who are enjoying a longer break, we certainly made use of that space. The bed was superbly comfortable, and provided a great night’s sleep. In terms of facilities, the hotel is certainly not limited. You’ll find a wonderful spa there to enjoy, which offers a selection of Elemental Herbology treatments, as well as an indoor pool, Finnish and bio saunas, a steam room, a Kneipp-bench, a tepidarium, and of course a small fitness centre for those looking to keep fit. If it’s wining and dining you’re after, then the hotel is certainly not lacking. You will find the hotel’s És Bisztró, which offers a modern brasserie experience, as well as the És Deli, which will fulfil all of your premium coffee needs. 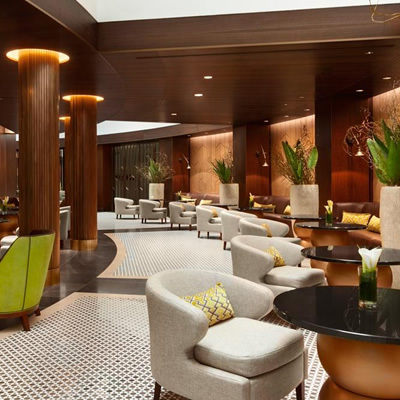 The Kempinski Hotel Corvinus is also home to Nobu Budapest, which is the first central European Nobu; as well as the Nobu Lounge Bar, where you’ll find a fine selection of saké, including the prize-winning saké by Hokusetsu. That’s not all however, as you can also enjoy Blue Fox the bar, which is quite a hotspot for nightlife, or The Living Room for a slightly more subdued vibe, aimed a laidback indulgence. This hotel truly does have it all, and we cannot fault it. The service was impeccable, and the location and facilities were up there with some of the finest. This hotel certainly made for an enjoyable trip to the vibrant city of Budapest, and it comes highly recommended by us as a great choice of accommodation.